A defaulted student loan is detrimental because most students have a very short credit history. This means they do not have other successful debts to counteract bad debt, in the case of a default. If you have defaulted on your student debt, take action fast. Quick action will avoid further negative consequences. The main fear is limited income. Most students do not make sufficient money to continue paying their other obligations. If not, then bankruptcy may be the only option. If you are facing a potential bankruptcy, then you should take immediate steps to reduce your expenses and increasing your income. You may consider consolidating or refinancing any other outstanding debts you have. Taking this step reduces the immediate pressure on you to make payments. Nearly every type of debt can be consolidated or refinanced, if you are willing to go through the process. Avoiding garnishment is critical because your employer will think you are responsible if your wages are garnished. 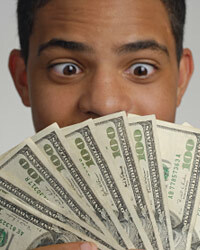 You will also see your credit score drop further if your lender has to garnish your wages to recover the sum you owe. Wage garnishment is the process whereby a debtor has a claim over your income. This typically only occurs if you have been sued over the balance of your defaulted debts. Some lenders are willing to work with you to establish a payment plan. A successful payment plan will reflect that you self-corrected your defaulted debt on your credit score and your employer will also never find out about your bad credit history. Once the threat of bankruptcy is no longer in the picture, you can begin repairing your credit. The best way to repair your credit is to use it and use it responsibly. Starting small is the only way to learn how to meet your debt payments in the future. A personal credit card is often the easiest form of financing to get approved for. Credit cards also offer great practice because they allow the borrower to set his or her own terms month by month. By learning to control spending on your credit card and pay down your balance each month, you are teaching yourself responsible debt management at the same time you are building your credit score. Once you have a minimum credit score to qualify, around 620 to 660, you can begin seeking installment loans to truly repair your credit. This is the fastest way to truly rebuild your credit. You will have to pay high interest rates in the beginning as your credit recovers. Starting with a small personal loan is one way to avoid paying too much in interest rates. Personal loans also have the greatest credit rewards because they do not require collateral. Taking out and paying off a high risk personal loan will set you up for new loans in the future, though it may be 5 to 10 years before your credit fully recovers.